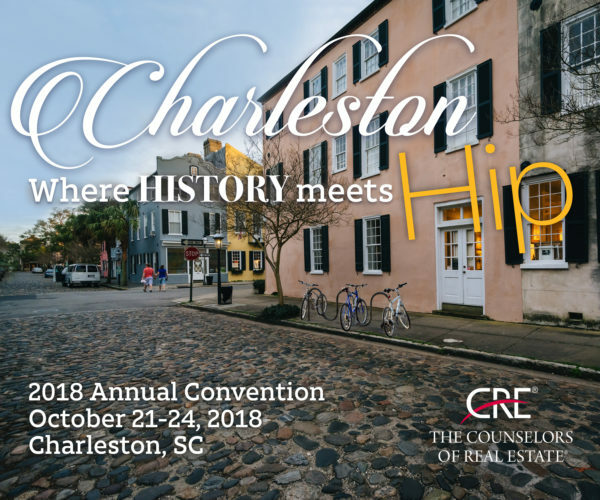 Charleston, the belle of the South, will host The Counselors’ 2018 Annual Convention. The resurgence of greater Charleston as an economic power, with its bustling port and a proliferation of new manufacturing plants — led by BMW, followed by Boeing and its Dreamliner, Volvo, Mercedes Benz, Samsung, and others — has fueled manufacturing, commercial, and residential growth. As a result, its real estate market is now experiencing an economic boom. The city is a unique blend of historic preservation and new development, displayed from its cobblestone walkways and historic landmarks to its dazzling nightlife and sophisticated art galleries. Known for its rich history, well-preserved architecture, and distinguished restaurants and boutiques, Charleston is a popular tourist destination and has received a large number of accolades, including “America’s Most Friendly City” by Travel + Leisure in 2011 and in 2013 and 2014 by Condé Nast Traveler, and also “the most polite and hospitable city in America” by Southern Living magazine. In 2016, Charleston was ranked the “World’s Best City” by Travel + Leisure. It’s where historic meets hip! Join us in Charleston and experience a dash of Dixie! Photographs taken at the Annual Convention may be used by CRE in coverage of the Convention in print or online publication or in the promotion of future events. Please send a separate email to info@cre.org if you do not want your photo published.